Students in south-eastern Tulare often struggle with academics, but one group of concerned parents are working tirelessly to change that. The Sundale Foundation owns two homes in the East Tulare Villas, a low-income neighborhood just outside of Tulare. They opened the V-Center in 2010 and added the second home four years later. The Foundation uses these homes to provide after school programs for kids in this community. “In these county offshoot islands, the communities kind of struggle,” said Seth Brown, Sundale Foundation Vice President. “When we started, you could sit in front of the door and watch a drug deal happen,” said Brown about the early days of the V-Center. 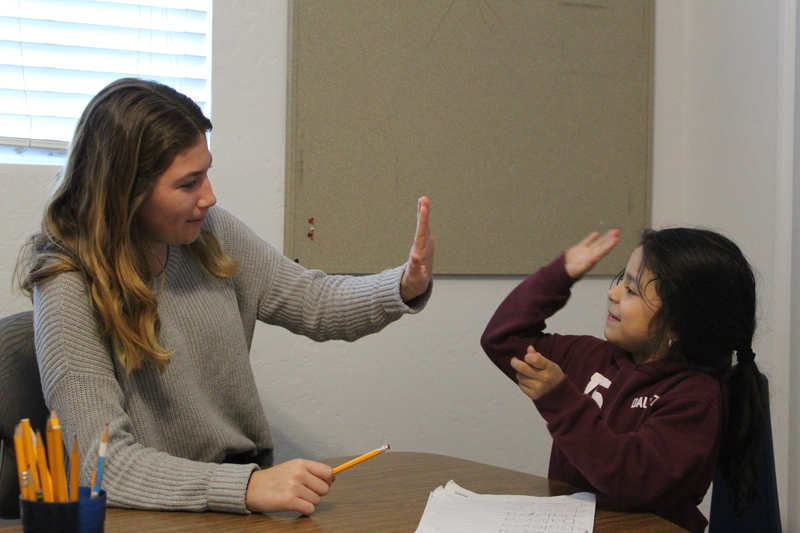 The Sundale Foundation Board saw that some students couldn’t stay on campus for their after school programs, so they decided to bring the program to them. “It’s been a great chance to see where I grew up and to change the opportunities for these kids,” said Brown. Though separate from Sundale Elementary School, the Foundation runs an after school programs for the Sundale students alongside a preschool. The V-Center often enlists Sundale alumni and forges partnerships with local businesses to keep operations running smoothly. “Every time we turn around we get more ideas and help,” said Wil Cushing, a Foundation Board member. After successfully establishing and managing the after school and preschool programs, the board is turning its attention more to the V-Center by offering extracurricular initiatives and adult classes. “If we get the kids in here, they’re going to learn the social skills they need,” said Cushing about extra-curriculars. One of the classes the V-Center offers to parents is a technological literacy course held in Spanish. Valejo spends much of her free time at the V-Center. She was the first one to open her home to the Foundation at the beginning of their project. “It’s grown tremendously. The first priority is homework and the parents like that,” said Valejo with a chuckle. She helps run the summer programs as well. Often, the kids are able to go on field trips during the summer to swimming pools, movie theaters, museums, and even take college tours. Recently though, Valejo has been enlisting the help of parents. “I wanted [parents] to have their own identity and they’ve taken off with it,” said Valejo. Parents have started to help more and more with meals, tutoring, and watching kids with a favorite event of theirs being Taco Tuesdays. “It’s something they know how to do and they can feel confident doing it,” said Valejo. Despite being in a lower-income neighborhood with high crime, the V-Center has had no issue with gangs or theft. “We’ve heard people say ‘I wish this was here when I was a kid. Maybe I wouldn’t have been involved in gangs,’” said Terri Rufert, Sundale Foundation President. The Foundation received praise from Tulare County Sheriff Mike Boudreaux for its work in the East Tulare Villa. “The V-Center program is exactly the kind of neighborhood-based outreach needed in our rural communities to keep kids safe and give them the tools they need to succeed,” said Boudreaux. Rufert says she’s happy with the progress made by the V-Center. The Foundation has plans to expand the work it’s doing as well. “We’re looking to offer more with enrichment with dance or sports or whatever it is, but it takes money and volunteers,” said Rufert. The Board often calls on alumni to help with anything from volunteering to house maintenance. Rufert recalled an alumnus donating their time to help fix the air conditioning during the summer. “To watch alumni come back and help out is just amazing,” said Rufert. She says the end goal for the V-Center is to course-correct the kids’ trajectory. “Now, kids are dreaming and speaking about what to do after high school because of the enrichment classes which is a big and very welcome change,” said Rufert.